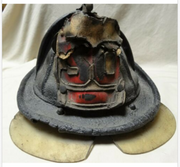 Hello Troops; I have expressed my thoughts about vintage war year fire helmets on e-bay, it moves me in a sad way... I have always felt your fire helmet was your resume, a business card, receipt of work well done. 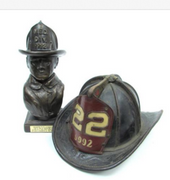 It is your personal trophy, prominently placed in your favorite spot near the fireplace when you leave the job. The beat up shape, wear and tear of previous battles with the red devil. It was your personal lifeline...f you were in trouble you would toss your helmet, and help would be on the way...Unfortunately, like the way of the scaling ladder, the trophy will eventually return to the quartermaster in the sky, or just neglected in an attic or basement until it fades away. I thought you might help me catalogue these treasures, once removed and they go on e-bay and leave it's owner, is when the fat lady sings. Hope you enjoy the following collection. And why not lead off with Dennis Smiths Engine 82 helmet. 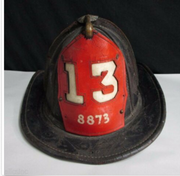 Note, there are two different Captain L3 helmets, the first is Captain Paddy Brown's helmet in honor and memory of 9/11 Brothers. Hope you enjoy, and please feel free to jump in with pics, stories and/or comments! Dan, each one of those helmets have their own story to tell. If they could only talk. 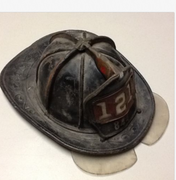 Not a FDNY War Years helmet but my father was a firefighter in Bridgeport, Ct. He was my Role Model and the guy I wanted to be like. 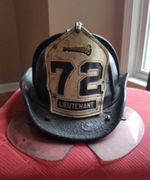 He retired in 1978 and he gave me his helmet, which I still have today. I will see if I can get one of the guys here (Brad Y., "signal 73" are you out there ?) to post the picture of it for me. I wrote a little story about him in 2009 on another web site. Here is my story of the guy who wore that helmet, my father, who I nicknamed "Smoke". I can well understand why your Dad is your hero, and very deservedly so. I also appreciate how you glide over your own heroism; it’s one very important point of the story and you haven’t given it enough ‘punch’. You didn’t just give a handout to Ed Martin and walk away, but you took the time and effort to buy him a cup of coffee and share some time with him which gave you such a wonderful story. So typical of a Fire Fighter to overlook the importance of a small gesture. You’re a good man, Willy. I know “Smoke” is proud of you and I can understand why.